A community garden located in the Mission District, located about a block and a half east of Mission Dolores Park. 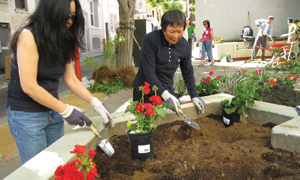 Dearborn Community Garden is owned by San Francisco Public Works. Muni access: J-Church -- 18th St. and Church Street stop. Walk east on 18th, past Dolores Street and Guerrero Street, to Dearborn. Left (north) on Dearborn, then up to Bird St., where the garden is located. 33-Stanyan -- 18th and Guerrero or 18th and Valencia. If off-boarding at Guerrero, walk a half-block east to Dearborn, then north to Bird St. and the garden. If off-boarding at Valencia, walk a half-block west to Dearborn, then north to Bird St. and the garden. 14-Mission or 49-Van Ness/Mission -- Off-board at 18th and Mission, walk west past Valencia to Dearborn St., then north to Bird St. and the garden. Dearborn St. & Bird St.